There must be something in the water at the Quinnipiac SigEp house. The past five student body presidents, including newly elected Mostafa Elhaggar, have been members of the fraternity Sigma Phi Epsilon. However, Student Body President Matt Desilets said there is no direct correlation between the fraternity and Student Government Association. Former Student Body President Ben Cloutier was both Desilets’ and Vice President of Student Concerns Evangelos Milas’ big in Sigma Phi Epsilon. Milas is Elhaggar’s big. Continuing the family line, Elhaggar is newly elected Student Body Vice President Jonny Atkin’s big. Atkin is Freshman representative Joey Mullaney’s big. About 68 percent of SGA members are affiliated with a Greek organization on campus, Desilets said. Though 26.16 percent of Quinnipiac students are Greek, Desilets does not think SGA is misrepresenting the undergraduate population. 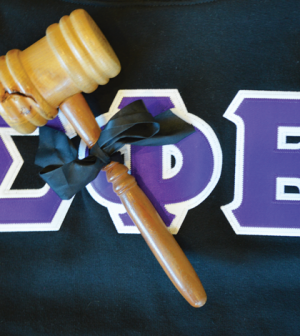 The student body presidents’ involvement in Sigma Phi Epsilon is “coincidental,” Elhaggar said. Cloutier was Milas’ mentor when he first joined SGA, but Milas said Cloutier never pushed Sigma Phi Epsilon on him. Desilets said having Cloutier as a big was a reflection of their friendship more than anything. Sophomore and Sigma Phi Epsilon member Andrew Brucella said he does not think his brothers’ involvement in SGA affects the organization. Sophomore Sarah Kennedy, who is not affiliated with a Greek organization, said the majority of SGA members being Greek “absolutely” affects their ability to represent the student body. Milas said he makes a point to not wear his letters around the office. Like Milas, Elhaggar said he did not join Sigma Phi Epsilon to “up his game” in SGA. “The letters come second, the students come first 100 percent,” Elhaggar said. Desilets said SGA always comes before his other involvements. Freshman Alpha Delta Pi member Sydney Labombarda said Greek affiliation does not hurt SGA members’ ability to represent the student body. Yet, she said it could be hard for a student who is not in Greek life to run against a Greek candidate. Newly elected Senior Class Vice President and Sigma Phi Epsilon member Joe Kohle said being in a fraternity will not further someone’s campaign. Freshman John Piazza, who is not a member of Greek life, said the trend of the student body president being a member of Sigma Phi Epsilon is not a big deal.